Many DIY recipes you’ll find on this site (and around the web) call for essential oils. Not only do most essential oils smell great, but they offer the antimicrobial properties you’ll want in many of your DIY projects. I love essential oils and use them for different reasons every day. Because I love them so much, I talk about them a lot and often get asked questions about how and when to use them. One concern that typically comes up is cost – essential oils fall into the “bigger initial investment” category of DIY ingredients that end up saving money in the long run. 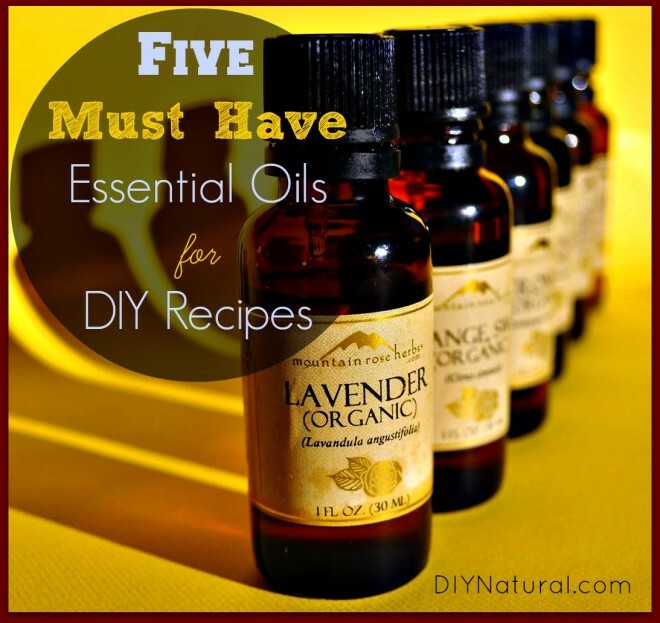 Because buying a lot of essential oils at once is not something everyone can do, I thought I’d share my top 5 essential oils to have on hand for DIY recipes. These are the oils I replace most often because they can be used in myriad ways. Lemon essential oil is very handy for cleaning and degreasing. Got pitch on your hand from the wood pile? Put a drop of lemon essential oil on it and rub it right off. Kids like to play with clay on the table? Just a drop or two will get the funky residue off in no time. (Try this before you spend 10 minutes trying to scrub it off). I also like to add a few drops to my dish water to help cut grease on dishes. Lemon essential oil is also very handy at deodorizing. For a stinky fridge, add a few drops of lemon essential oil to a cup of baking soda and let it hang out in there to absorb odor. 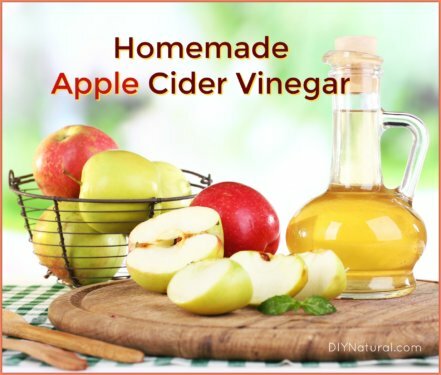 I also like to put one cup of water and one cup of vinegar in a glass spray bottle (this is one of my essential accessories for using essential oils) with 10 drops of lemon essential oils as a deodorizing spray for my wooden cutting board. 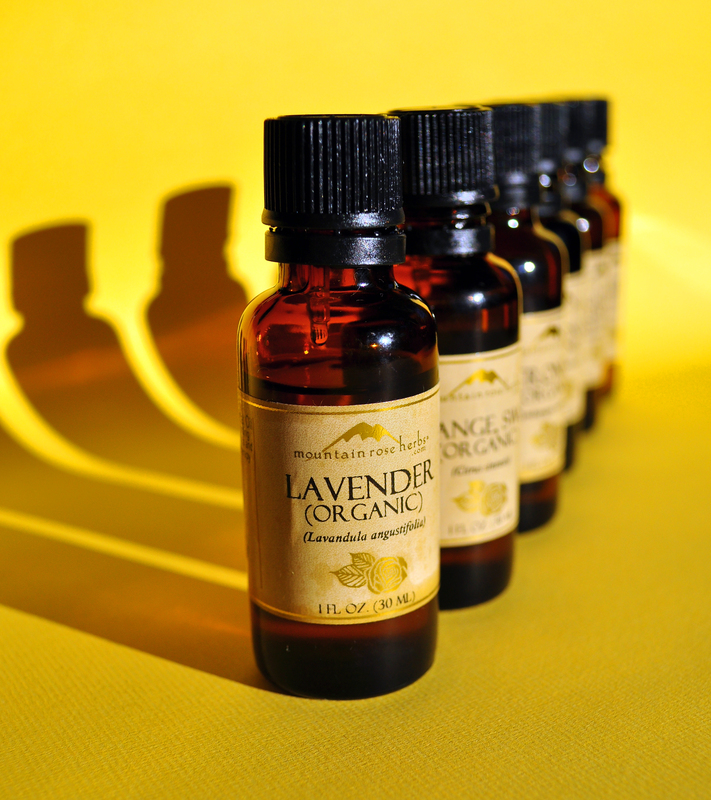 Lavender essential oil is great for soothing – both the nerves and your skin. Aside from diffusing lavender aromatically before bed to induce peaceful sleep, I use lavender essential oil a lot in natural beauty recipes. One of my favorites is this lavender mint lip balm, which uses both lavender and peppermint essential oils. It smells amazing and the infused herbs help heal dry, chapped lips. Lavender essential oil is also safe for use on babies – as long as it’s pure, of course. 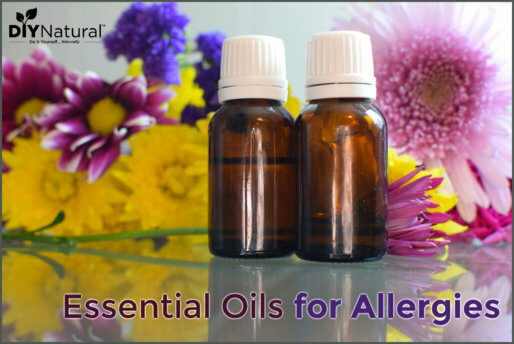 (Find pure essential oils here.) I like to use it and tea tree essential oil in this homemade diaper rash ointment. Tea tree essential oil is a great antimicrobial oil. 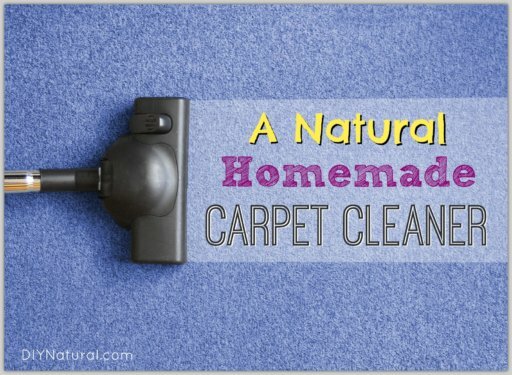 It can be added to homemade cleaning spray to kill germs around the house without the harmful side effects of commercial cleaners. I like to use tea tree essential oil in natural beauty recipes. A few drops goes into my homemade antibiotic ointment to help ward off infections. I also like to add a couple of drops to my homemade shampoo and conditioner recipes. Eucalyptus essential oil is antimicrobial and a great addition to DIY cleaning recipes. When I need to mop my floor, I just add a couple squirts of liquid castile soap and 10 drops of eucalyptus essential oil to my mop water. A yoga instructor I know just uses water and eucalyptus oil in a spray bottle to clean both yoga mats and her hardwood floors. Eucalyptus is also a great expectorant and can be diffused in the air when you have respiratory issues. You can also add a drop or two to a tablespoon of coconut oil to massage on your chest and back to help you breathe better during a cold. Peppermint essential oil is antibacterial, analgesic (it soothes pain) and anti-inflammatory. It’s also refreshing and cooling and great to use in the summer time when you’re too hot. Looking for a chance to use these essential oils? We have many recipes to get you started! If you need more info, read our other article on how to use essential oils. What are your top essential oils? What do you use them for? Is lavender oil good for hyper kids? I have been using lavendar and lemongrass for years. I used to make candles and there is nothing like the fresh smell of a lemongrass candle burning in the evening. I use wild orange in my laundry and to stop cats from peeing on a certain spot. Oregano for sore throats and to ward off colds. Lavendar on my kids’ feet to calm them down and to help sleep. I dab a drop or two inside their pillow case for sleeping. Arnica is a great oil for bruising and abrasions. I made my own car deodorizer with lavendar and lemon (or whatever scent I choose for the week). Much much better than those hanging trees with the fakey scent. Yuck. I have all of these essential oils and I love them all! I also really like grapefruit and wintergreen. I like grapefruit eo in my homemade deodorant. I have made a topical pain control mix with eo’s. I use peppermint, eucalyptus, wintergreen and lavender all mixed in liquid coconut oil. I have arthritis in my knees as well as Achilles tendinitis in my heel. This mix works great! It works as well as when I take over the counter pain meds, and sometimes even better. I agree with all of you list. I use Tea Tree oil and Peppermint oil a lot, as well as Lemon (OH, that fresh smell!) But another essential for me is Pennyroyal oil. Not only is it a great bug repellent but it also works just beautifully on bruises, believe it or not! Now, one must be very careful to use only externally as one historic use of Pennyroyal is as an abortant, which is why it is awfully hard to find. But I tend to bruise a lot and find that Pennyroyal helps bruises to heal much faster. I also use it on the inside of my cats’ bedding (NEVER use any essential oil directly on the cats as their systems cannot handle most essential oils) to help with flea treatment. My elderly cat has hyperthyroid problems and I don’t want to additionally trouble her with the usual flea poisons. Pennyroyal seems to do the trick and have them both less itchy. Thanks for your list of “musts”. Very helpful. We have 3 cats & I’ve read you shouldn’t use any citrus oil around them. Any ideas for a stand-in for the lemon oil (although I love the smell)? I’m also spraying outside around my doors and windows to keep the bugs out and to experiment if the peppermint will work on lizards as well. I don’t mind them being outside, heck I’ll even talk to them when they are out there, but when they are in my bedroom? Eek! I’m hoping they hate peppermint as much as the spiders do! I use lemon essential oil all the time- in my water, cleaner, etc…. Can’t live without my essential oils. I love essential oils also. I have been using tea tree oil to treat bad toenails, as it has anti fungal properties. One toenail has nearly cleared up, but the other has a way to go. I have now changed over to eucalyptus oil to see if it helps, as this one is taking a long time to fix. I think a change may help. I also use lavender oil in water as a general cleaner. It leaves a lovely fragrance in the room.